DESCRIPTION: The TEGAM-Pragmatic low-cost solution for basic function generator applications. 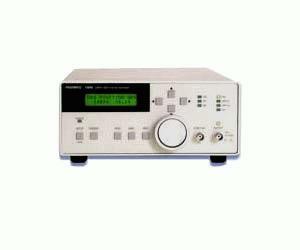 This unit generates sine waves from 10mHz to 20MHz and allows linear and log sweeps in either direction. Both continuous and trigger modes are available for more flexibility. Equipped for complex modulation testing, an external port allows direct digital control. Amplitude (I and Q) phase, and frequency are programmable to 32 bit resolution.